At Peosta Dental, we believe you deserve the best. Dentistry is has changed a lot over the last 20 years and we believe that you deserve an experience that is different. We believe in offering an alternative to same old tired dental office that still has the same wall paper on the walls from 20 years ago. So it is our mission to help our patients achieve a stable, healthy dentition while using the latest in dental technology. We also believe you should be comfortable when visiting the dentist. So whether it is a wifi password, a neck pillow, a blanket, or your favorite tv show on the monitor in front of the chair, just let us know and we will make it happen for you. Dr. Austin Reed and the Peosta Dental team provide advanced dental care, and every visit is tailored to you. We’re experienced, compassionate professionals who thrive on the personal connections we build with the community. Our practice offers leading-edge treatments and techniques, combined with a commitment to exceptional customer care. Not only will we help you achieve and maintain optimal oral health and a beautiful smile, we’ll make your dental visits stress free! Ours is a family-friendly dental practice. We make sure every patient receives the highest quality of care, whether it’s a child at the very first visit, an adult wanting to improve a smile, or a grandparent seeking restorative treatment. Nothing makes us happier than caring for a family’s smiles, watching the children grow up, and being part of their life story! We respect each person’s individual situation, and strive to learn what they desire and respect their concerns. Because we offer a range of general, cosmetic, and restorative dentistry, Dr. Reed is able to customize every treatment and each visit. He’s a skilled practitioner and delivers stability, function, and the best smiles. We’re attentive to patient comfort and will move mountains to ensure your visits are painless. We understand that some people have dental anxiety and avoid seeing a dentist at all costs. If this is you, we’d like to help. We promise to listen without judgment and work with you, at a pace you set, to help you regain your oral health. In addition, Dr. Reed offers nitrous oxide (laughing gas) to help nervous patients relax. We emphasize preventive care and patient education, so you can keep your smile healthy for life. We’ll teach you about good home dental hygiene practices, and the connection between oral health and overall wellness, as well as support you while you develop good habits. We want to make caring for your family’s smiles easy! You’re a busy person and your family is on the go. We understand you have many other commitments, so we strive to run on time and refuse to overschedule. Although our reception area is inviting and comfortable, you won’t spend much time in it while waiting to be seen! Please contact our Peosta, IA dental office for more information and to schedule a visit for yourself or a loved one. We serve Dubuque, Asbury, Farley, Dyersville, Epworth, and all surrounding communities. 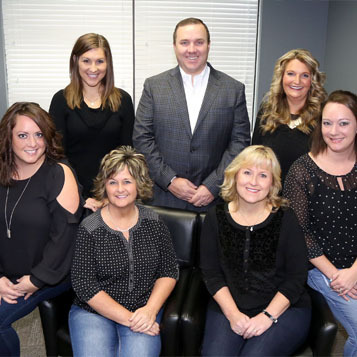 Dr. Reed and the Peosta Dental team are excited to meet and welcome you and your family to our dental family. Together, we’ll help you achieve a lifetime of healthy, beautiful smiles!